1 Preheat oven to 375°. Arrange bell peppers and red onions on baking sheet; drizzle with 1 Tbsp. olive oil. Roast 15 minutes or until peppers are tender. Let cool 10 minutes. 2 Decrease oven to 350°. Slice top from bell peppers and reserve; remove seeds. Set aside. Heat remaining 1 Tbsp. olive oil in large skillet and cook Spanish onion, garlic and chile pepper over medium heat, stirring occasionally, until onion is tender, about 4 minutes. Add ground beef, cumin and chili powder and cook, stirring occasionally, until ground beef is browned. Stir in chorizo and cook 3 minutes. Remove from heat. 3 Finely chop red onions. Stir red onions, Hellmann's® or Best Foods® Real Mayonnaise and cooked rice into ground beef mixture. 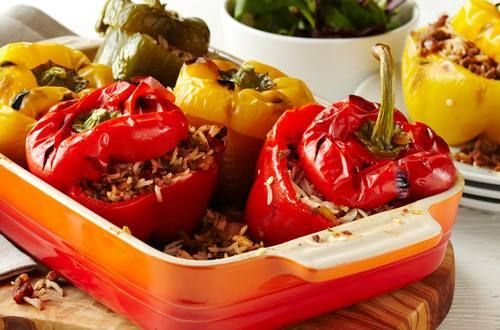 Stuff peppers with rice mixture, then top with pepper tops and arrange in baking dish. 4 Bake 20 minutes. Remove pepper tops and set aside. Top peppers with cheddar cheese and continue baking until cheese is melted, about 5 minutes. Top with pepper tops to serve.